Fruits are the natural delights which are not only just yummy but nutritious too. They are vital for the maintenance of our body. Besides being tasty, fruits improve the metabolism, digestion and keeps the body functioning. They are good source of vitamins, minerals, fiber and antioxidants essential for the health of our body. They offer a lot of health benefits. Consuming fruits the right way can make the body function well and keeps the risk of several chronic diseases at bay. Fruits have been found to be good source of antioxidants. Regular intake of fruits in the diet helps to flush out unnecessary toxins and improves the quality of blood and purifies it, thereby, reducing the occurrence of acne. 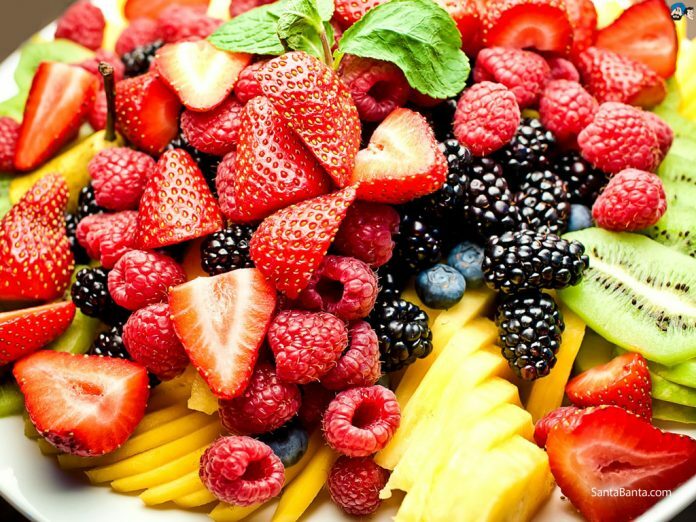 Fruits being a good source of fiber provide a feeling of fullness and fewer calories. They provide maximum nutrition if taken whole. Fruit juices does not offer the same nutrition as a raw fruit does. Fiber containing fruits alleviate constipation, indigestion and bowel irregularity disorders. Fruits can help keep you awake naturally as they supply instant energy and keeps you fresh and going throughout the day. Fruits help to keep the skin supple and hydrated and nourishes it as it contains essential vitamins and minerals and antioxidants. It helps to reduce acne and ensures healthy growth of hair. Fruits contain natural sugars, such as fructose, glucose, maltose, galactose and sucrose. Natural sugars, taken in moderation, helps prevent the risk of diabetes. Fruits contain dietary fiber which helps in proper digestion and prevent stomach problems like constipation and gastritis. NOTE: Incorporating fruit to your diet is a healthy option but it is advisable to consume it in a raw form along with the skin of the fruit as the skin contains majority of the fiber which is essential for the regular bowel movement and also regulates blood sugar levels. Fruits contain water which flushes out the toxins from the body. Consuming a significant amount of fruit along with regular exercising routine can help reduce weight and maintain it. Fruits are an instant source of energy. Fruits eaten on an empty stomach are digested more quickly. They provide an immediate energy boost as they are loaded with vital nutrients. Also, natural sugars found in fruits help reduce fatigue levels. NOTE: Keeping a gap of around 1-2 hours between your meal and fruit time is essential as it ensures easy and proper digestion as fruits consumed with a meal or right after a meal can cause acidity and indigestion.